End cutting pliers (or nippers) are designed to perform flush cuts of soft wire and are frequently used to extract smallish nails (Source). Some buyers use them just for pulling nails, while others use them to cut hard-to-reach nails, nipping off the edges of metal pieces, cutting cable ties, and home remodeling tasks (GarageJournal). One of our favorites is the Stanley 6.5" MaxSteel End Cutting Pliers- they are drop-forged from high-carbon steel and are designed for performing flush cuts of soft wire, or pulling out smaller-grade nails. These hand-finished nippers feature induction-hardened cutting edges. Stanley Tools says that, according to their research, these specialized edges are engineered to decrease cutting effort by 45%, and boost the nipper's edge life by up to 33%. Let's take a look at 5 of the best-selling end cutting pliers on the market and see how they compare. These end nipper pliers offered by Tekton are well-made, efficient, comfortable to hold and practical. Users love the price and quality, but some do note that they are manufactured in China. These end nippers measure 8” x 2.2” x 1.2”, and they feature twin induction-hardened blades for improved performance, non-slip grips for comfort and a weight of 12.8 ounces. The 8-inch end pliers are made from high-strength chrome vanadium steel, and they are suitable for copper, aluminum, or soft steel wire in the following forms: solid, stranded and braided. A buyer comments that these end cutting pliers are the perfect addition to his enormous tool collection and that they are ideal for removing siding nails. The reviewer says that they are sharp, well made and affordable. He highly recommends them as one of the best end pliers available. Another customer shares that he uses the end pliers for prying and removing old nails and that he doesn’t have any complaints. He adds that the pliers are light and that they cut electrical wire or zipping ties quickly and smoothly. However, some customers have complained that the quality of the Tekton end nippers is not what they expected and that they broke very quickly. A purchaser complains that they broke after four horseshoe nails and that they are cheap and flimsy. He doesn’t recommend them at all. These 7.5-inch end cutting pliers offered by Channellock are handy, precise, sharp and practical for any professional. 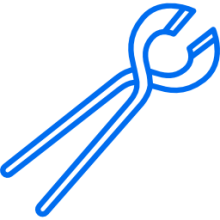 Users love that the pliers are efficient and well-balanced, but some do note that they are expensive. These end nippers measure 9.2” x 2.9” x 1”, and they feature laser heat-treated cutting edges for durability, high carbon drop forged steel construction for improved performance, and a unique coat that prevents them from rusting. They also have blue comfortable grips and a weight of 9.6 ounces. The Channellock 7.5-inch nippers are made in the USA. A customer shares that he uses these end cutting pliers every day and that they remove all types of nails quickly and safely. The reviewer adds that the pliers fit well in his tool pouch and that they are perfect for every carpenter. Another user mentions that the nippers don’t rust after the protection coat wears off and that he is extremely impressed with their quality. He recommends them to anyone searching for the best end cutting pliers. A purchaser also shares that the Channellock nippers are better than all other brands and that they are a necessity for every handyman. However, a customer has complained that the pliers are heavy and that it’s difficult to work with them. Another reviewer also says that they shatter on the first nail and that he is very disappointed. If you are looking for end nippers of high-quality and design, you might take a look at these 6.5-inch end cutting pliers offered by Stanley. Users love the price and the sturdy construction, but some do note that they received a defective product. These nippers measure 9” x 3.3” x 0.8”, and they are made of high carbon drop forged steel for extra durability. They feature induction-hardened cutting edges, and they reduce cutting effort by 45 % and they have a 33 % longer cutting edge life. The Stanley end cutting pliers meet or exceed ANSI standards, and they are suitable for flush cutting soft wire or pulling small nails and brads. A purchaser shares that the grips feel more comfortable in his hands than he expected and that it’s perfect for pulling finish nails. The reviewer adds that he uses the Stanley nippers regularly to cut hard to reach nail and that he highly recommends them as the best nippers available. Another satisfied user mentions that these cutting pliers are strong, well-made and affordable and that they would last for years. A buyer also comments that these end cutting pliers work perfectly and that Stanley always offers high-quality tools. However, some customers have complained that the pliers broke quickly after they bought them. A user complains that he bought three pairs of pliers and that all of them got chipped a couple of days later. These 14-inch heavy-duty end cutting pliers offered by Apex Tool are well-balanced, strong, sturdy and useful for large wires and nails. Users love that the pliers are sharp, but some do note that they are not suitable for nails that are flush with the surface. These end nippers measure 1.5” x 4” x 17”, and they have a lightweight design to decrease hand fatigue and a weight of 2.1 pounds. They are made from drop-forged alloy steel, and they feature electronically induction hardened cutting edges for improved cutting performance, a polished head with a black finish, and heat-treated handles and jaws. In general, users have a high opinion of the Apex crescent end nippers, and they praise their performance, sharpness, and design. A buyer comments that these nippers will cut through the toughest nails and that they proved excellent leverage thanks to their length. The reviewer adds that he recommends them as the best end nippers ever invented. Another customer shares that he uses them to clip his horse’s hooves and that the pliers work great. He states that the nippers would last for years and that they are excellent for removing nails in hard to reach areas. However, some customers have complained that it takes too much effort to cut through nails and the nippers got chipped quickly. Some users also say that they are not suitable for hard to cut nails. These 4 ¼-inch end cutting nippers offered by Irwin are practical, comfortable to use, sharp and suitable for every handyman. Users love that the pliers cut smoothly, but some do note that they are overpriced. These end nippers measure 7.1 x 3.2 x 1 inches, and they are made of nickel chromium steel for extra durability and longevity. They feature spring-loaded action to reduce hand fatigue, ProTouch grips for extra comfort, induction hardened cutting edges and a weight of 2.2 ounces. These cutting pliers also have a wide throat clearance that allows you to cut semi-flush nails and rivets. A buyer commented that he was surprised by the quality of the Irwin end nippers and that they would cut through both hard and soft metals. The reviewer adds that he has used them on steel cables, plastic ties, and electric wires and they don’t show any signs of chipping. Another customer mentions that these end cutting pliers have become part of his toolkit and that they are perfect for small cuts. A happy user shares that he used them to cut 18 gauge stainless wires and that he encountered no problems. The purchaser also says that the grip is very comfortable and that he highly recommends them to any professional. However, some customers have complained that the pliers are not suitable for pulling frets because they have large bevels. The first pair of end cutting pliers we examined were the 6 and 8-inch Tekton option. The manufacturers advertise their nipper pliers as equipped to deal with aluminum, copper, as well as softer steel wires that are either braided, stranded or solid. This pair of end cutting pliers features induction-hardened twin blades designed for sharp and durable cutting performance. They are built from chrome vanadium steel and the opposing twin blades are engineered to generate even and clean cuts in a consistent manner. One buyer we interviewed, who initally wondered 'what is a nipper? ', ended up buying, and endorsed these pliers as lower-priced options in comparison to those produced by Channellock, the tool company renowned for its American manufacturing. Other buyers concur, saying that these Chinese-made nipper pliers are an inexpensive, entry-level option, with some users noting that they don't have the necessary durability have to be a long-term option for you. The second pair of end cutting pliers we examined was the 7.5-inch Channellock end cutting plier that features laser-treated cutting edges for extended durability. They are manufactured from C1080 steel and treated with a rust-prevention coating. These end nippers have received mixed feedback- with one professional electrician saying that they are an exceptional option if you need to remove nails as well as perform other cutting tasks. A carpenter we interviewed told us that primarily he has employed these cutting pliers to remove staples and nails, saying that retailers like Home Depot, Lowes and Walmart did not have this Channellock option in stock when he went looking, so he ended up purchasing it online. A professional remodeler told us that he had been in the market for a pair of American-made end cutting nippers, and he says he has been mainly satisfied with Channellock nippers- saying that the clamping edge has retained its cutting capability for a long time. One buyer went against the tide, saying that he only used these Channellock nippers several times before his pliers completely broke- not a recommended option from this reviewer. He ended up going with a Knipex nipper. The third pair of end nipper tools we looked at was the StanleyMax steel 6.5-inch plier. The manufacturers say that it is built from high-carbon steel and their research has demonstrated that its proprietary build has decreased the effort it takes to make a cut by 45% and its edge sharpness life has been boosted by 33%. 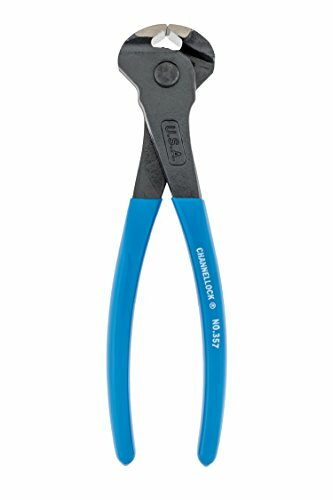 Further, they specifically recommend this pair of pliers if you are working with soft wire or have to pull out a variety of smallish nails and brass. Buyers were impressed by the comfortable grip of the handles and also recommend its ability to remove finish nails and other smaller nails. Others say that these Stanley end nippers provide solid strength at a reasonable cost. Another reviewer writes that purchasing these end nippers one off as opposed to buying a package is preferable because these have ended up being a more durable and effective option than throw-away items included in bulk, toolset packs. The fourth pair of heavy duty nippers we examined is produced by the Apex Tool Group who advertises it as a lightweight, but strong, option for rugged construction site use. It's built from drop-forged steel and features induction-hardened cutting edges, all polished to an attractive black finish. One service professional told us that these end nippers have been effective specialized crimpers, enabling him to nip a variety of nails and wires. Indeed, another buyer concurs, saying that the specialty tools are so amazingly functional for pulling out nails that they should be your first option instead of using crowbars or the backs of hammers. One reviewer did have some difficulty using them, saying that he was working on protruding flooring nails, trying to clip them and found that the cutting edges of his end nipper were chipped, which might be attributed to the particular strength of the nails he was working on. It would seem, from the buyer feedback we have received, that these end nippers are best used on weaker and finer nails, as opposed to exerting them on stronger and more rugged nails. The last option we looked at was the Irwin Tools end nippers- they are a nickel chromium built, spring-loaded nail cutter tool. One Irwin Tools buyer we spoke with recommended them because the blade edges are effectively hardened for long-term use, the perpendicular orientation of the blades provides clean cuts, the handles are comfortable to use and the cutting force is solid. One buyer purchased them to work on softer metals like tin and copper, finding that they were effective for operating on the soldered connections. Further, a electrician says that they have been durable and effective working on plastic ties, and steel cables with these end nipper blades retaining their sharp cutting surface, unmarred by the high-leverage cuts. Other reviewers have endorsed them, as well, saying that in general they always go with Irwin Tools because it is a renowned brand that produces quality craftsmanship, specifically for specialized hand tools like this. Indeed, as other reviewers have noted, these end nippers don't work incredibly well if you are trying to cut flush against a flat surface.